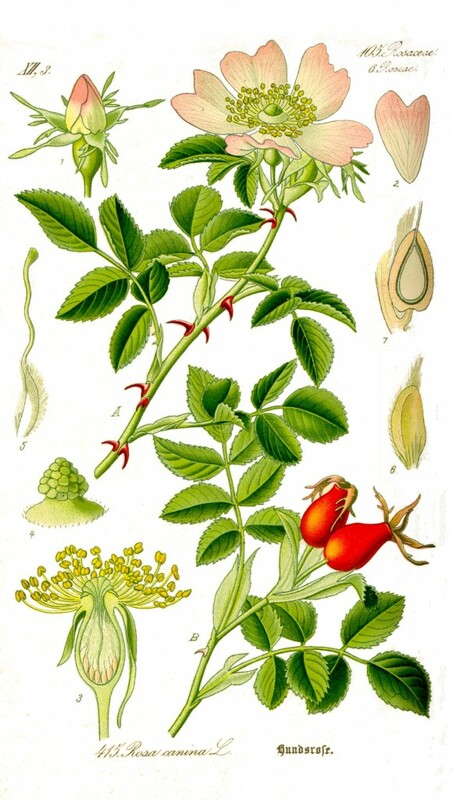 Rosa canina is a prickly shrub to 3 m tall, branches arching; stipules wide above. Leaves alternate, pinnate, leaflets 5-7, 2-4 cm long, elliptic, margin toothed. Flowers white to pink, 4-5 cm wide, clusters of 1-3, floral base smooth, sepals lobed, deciduous. Fruit hard achenes enclosed in fleshy, bright red rose hip (hypanthium),1.5-2 cm long, elliptic (Rehder 1986). Habitat: Horticultural plant. Sometimes escaped or persistent in overgrown natural areas.